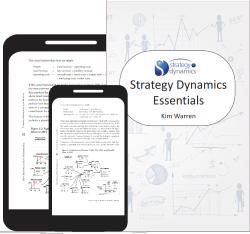 Strategy Dynamics Essentials is a highly accessible textbook - it is available in both print and Kindle formats and as we have now published it independently it is very affordable. A key motivation behind development of “Essentials” was to make it easier for teachers to include strategy dynamics into existing classes, whether on strategy or on other management topics where the approach is valuable – marketing, HR, innovation or entrepreneurship for example. Use the basic principles from chapters 1 to 4 to show how a simple business operates and performs, using popular case examples such as airlines or retail store chains. (See in particular, the updated analysis and models of Europe’s low-fare airline Ryanair). Use some of the more advanced concepts around intangible resources and capabilities from chapters 9-10 to clarify how these tricky factors work in some case example. Finally, you may want to most or all of the chapters to construct a complete course. You should be able to find your way around the book and related teaching materials quite easily – it matches exactly the chapter structure of the full textbook and the class structure of the online course. But let us know if you have any questions and we will be happy to help. Registered teachers can download a PDF inspection copy of the text. Create an account or login to request registration. Registered teachers can download a PDF inspection copy of the text. Request registration here.